i hadn’t planned on it. i was perfectly content watching the game on TV and saving the money should the Steelers play in the AFC Championship game. still in bed new year’s day checking my e-mail, i was alerted that NFL sanctioned playoff tickets went on sale. so i clicked clicked just to see what was out there as the opponent has not been named and hell at that time nor had the date or time. seat location, price. i’ve come to all but depend on the severe advantages and good deals when purchasing a single seat, soooooo…. what was curious this time was the low level of anxiety and how quickly the confirm purchase button was clicked. i remember the “first” time i did this for the Kansas City playoff game Jan 15, 2017. i was at work and when i saw the seat location vs ticket price and realized i could do this i broke out into a sweat. i paced around my area and had to talk it out with a co-worker. after about 30 minutes of checking airfare, hotel rates and rental cars i faced east, swung a chicken over my head 3 times and bought the ticket. boy what a high that was. the nervous adrenaline pumping thru my body. from idea to on a plane in less than 24 hours. zoom zoomin’ like that on the 15th day of 2017.
that kinda sent the tone for the rest of the year. it got to the point i felt i could go anywhere anytime. and kinda did. 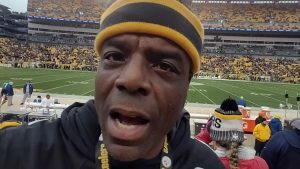 i don’t want to say the thrill is gone, but after buying a ticket on a whim to see my beloved football team in a play-off game in Pittsburgh- 40 yd line Steeler side 10 rows up, i rolled over to go back to sleep.